The author’s chosen method of photography became an integral part of underlining and highlighting the purity of the moment caught. 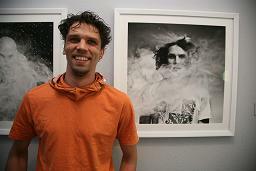 As a result, people got almost supernatural image that moved them somewhere between heaven and earth. The exibiton Purgatory took place from 2nd to 22nd June, 2011 in Riga. 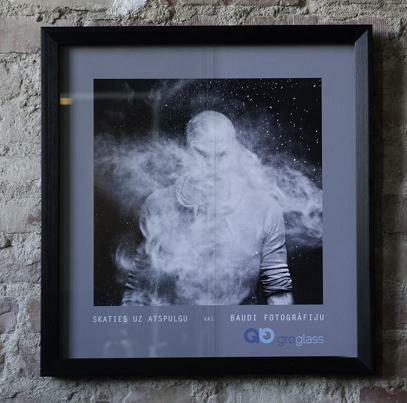 All of the photographs in the exibition were framed with Artglass™ by GroGlass®. 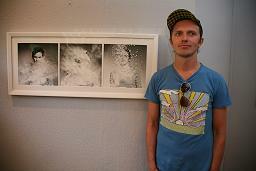 Find more about Nils Vilnis on www.vinils.lv. Welcome to GroGlass® CE marking! Products are marked CE if they were verified for complicity with all relevant essential requirements before being placed on the market and are conformed to the harmonized European Standards. “New Approach Directives” provides essential requirements for all product groups through various product directives, including glass products. We are pleased to announce that GroGlass® products have successfully passed the examination for conformity and were marked CE. The GroGlass® booth was divided into 2 parts: one part was showing the benefits of Artglas™ in a gallery of 6 pictures and second part was explaining the science behind such performance of the glass as well as benefits of surface smoothness, cleanability and scratch-resistance. Once again we would like to thank all GroGlass® booth attendees for the interest in our products. More information about the trade show you may find here www.wcafshow.com. 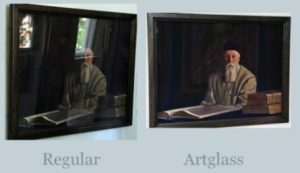 The Latvian National Museum of Art has re-glazed 69 artworks exhibited in the Room of Graphic Art and the Roerich Collection with the unique anti-reflective glass, produced in Latvia. 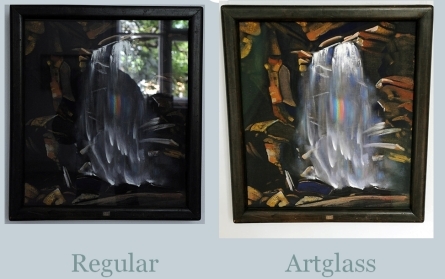 Compared to the regular glass, Artglass™ reflects 13 times less light, which makes the glass in front of artwork virtually invisible. Without the annoying mirror-like reflections, the artwork behind the glass becomes more clear and visible. 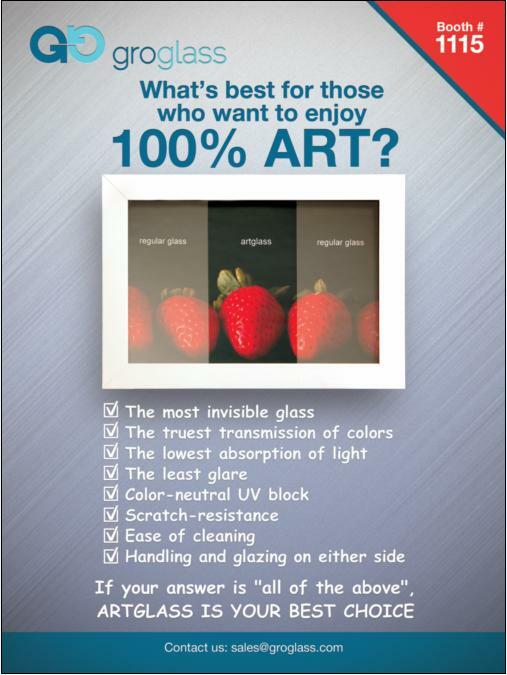 In addition, Artglass™ blocks most of the harmful UV radiation, preventing it from damaging the artwork displayed behind this glass. “A little known fact is that art lovers and picture galleries around the world now associate the Latvian-made Artglass™ with the highest quality that can be obtained among current producers. The Pinacoteca of Brazil, the Basel Art Museum, have all recognized this advantage and are now displaying their most prized works behind Latvian-made Artglass™. GroGlass®, the producer of this glass, has recently donated glass for 68 treasured works displayed at the Latvian National Museum of Art’s Graphics Room and Roerich room. And the good news for the Baltic museums and galleries is that they can now obtain the best glass in the world, but without intermediary margins and high transportation costs.” says SIA GroGlass chairman of the board Alexander Kelberg. 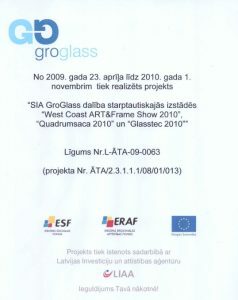 GroGlass® started its operations in 2008. 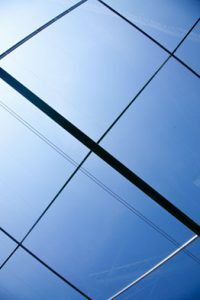 Company produced glass with anti-reflective coating is used in construction, in electronic displays, in art framing, in solar energy absorption panels and in greenhouse construction. Processed glass is used also in other areas, if additional light transmission or decrease of reflections is needed. 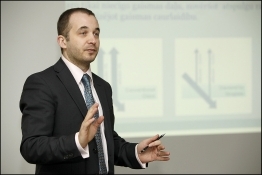 In 2010 GroGlass® is working on research to design the glass coating that would ensure energy saving and decrease the gas emission effect, creating both invisible and energy-efficient glass that could be used in architecture, lighting fixtures, as well as in shop equipment, e.g. cold displays, production. 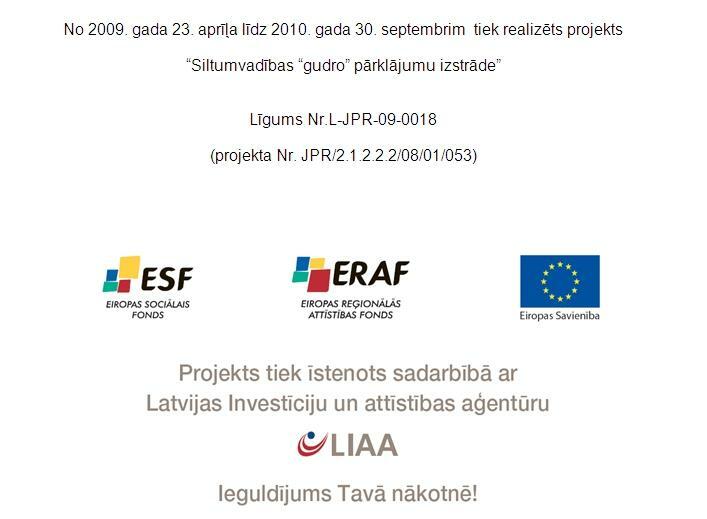 On July 8th, 2010 the European Business Awards sponsored by HSBC (www.businessawardseurope.com) announced that GroGlass SIA is to represent Latvia in the prestigious 2010 Awards programme. GroGlass SIA beat off stiff competition to be selected as one of 10 Country Representatives and will now compete for a coveted Ruban d’Honneur in the next round of the competition. Final category Award winners will be unveiled in Paris on 16th November. Now in its fourth successful year, the European Business Awards has identified some of Europe’s brightest businesses based on their ability to demonstrate the three core principles at the heart of the Awards programme. The esteemed panel of judges were looking for organisations to represent Latvia who exhibited innovation, business excellence and sustainability. Alan Keir, HSBC Group General Manager and Global Co-Head Commercial Banking, comments, “As we start to turn the corner from what has been an unprecedented chapter for businesses, we believe it is essential that we both acknowledge and celebrate the ingenuity that has enabled many companies to survive and often thrive across Europe during this time. You are very welcome to attend our booth #1115 at WCAF in Las Vegas this year, where our Artglass™ products line will be presented. More information about trade show you may find here www.wcafshow.com. 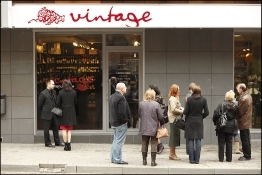 On April 7th, 2010 for the first time in Latvia in the store window a unique window has been installed – a premier wine store “Vintage” in Riga was the first to be glazed with Diamond by Groglass® anti reflective glass. Diamond by GroGlass® with an anti-reflective coating installed in double glazed unit, compared to the usual DGU window, reflects 15 times less light, which makes double glass barely noticeable, easy to see through, and eliminates the appearance of mirror-like effects. 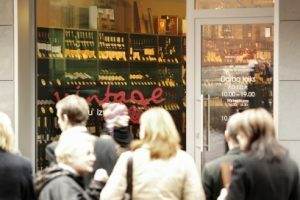 At the time when for business it is particularly important to increase customer traffic and turnover, the developer has decided to install the glass with anti-reflective coating, in order to provide much better through view and make the products displayed in the shop much more visible and attractive. On March 3rd, 2010 USA ambassador Judith G. Garber visited GroGlass® facilities. The aim of the visit was to learn more about companies which are supported with investment from USA. Ambassador was delighted to find out that Groglass® is a very innovative company which has already impressed many customers around the world with the premium anti-reflective glass coatings. GroGlass® provides a great example of the kind of export-oriented, high-technology industry that every country hopes to attract. I am proud to see American entrepreneurs advancing this kind of business in Latvia. Participation in Glasstec 2010 was supported by Investment and Development agency of Latvia.